At 11am this morning (CEST) the parts of the Rosetta spacecraft that communicate with the Philae lander, perhaps the best known part of the Rosetta mission, were turned off in order to save power in the final mission phase. Nothing has been heard from the lander since July 2015, but the communications gear on the Rosetta orbiter was nonetheless left powered up until now in the hope of receiving a signal. 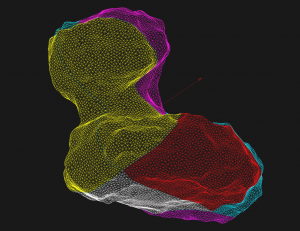 The figure above shows a computational grid from Ying Liao at the University of Bern made from an accurate shape model of comet 67P. This grid (with over 140,000 facets for the cometary surface) will be used together with observed surface temperatures to test different models of outgassing. The grid resolution used for such modelling is a compromise between accuracy and computational time – each model run will take about 14 hours. The colours in the grid are to guide the eye and don’t have any scientific meaning. 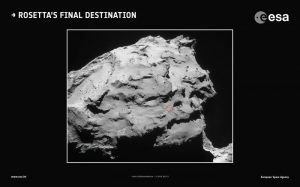 ESA today (21st July) announced the location of Rosetta’s final resting place – the spacecraft will make a hard landing (‘controlled impact’) on the Ma’at region of the comet on 30th September 2016 at 10:30 UTC (12.30 in Europe). This region was chosen in part because of its dynamic nature with active pits. The landing will take place by means of elliptical orbits of ever decreasing size, and the spacecraft wil continue to take pictures on its way down. The spacecraft was never designed to land, and even if it survives intact it will not be able to correctly orient its solar panels or antenna and so will rapidly run out of power and be unable to communicate. Active pits in the Ma’at region. Image credit: ESA/Rosetta/MPS for OSIRIS Team MPS/UPD/LAM/IAA/SSO/INTA/UPM/DASP/IDA.